You don’t have to drill good money habits into your kids for them to get it. They’ll pick them up just by hearing you say these words. Kids are smart—they know that if you buy a new coat, but “can’t afford” to buy them a new Bratz, something’s fishy. The fact is, you could afford to buy the toy, and using phrases like “Mommy’s broke,” only creates confusion. “You’ve got to let your kids know it’s about prioritizing and budgeting,” says, Leslie Truex, family finance expert and author of The Work-At-Home Success Bible. So say it’s not in your budget instead. Lesson learned: You’re choosing not to spend your money so that you have it for another use. 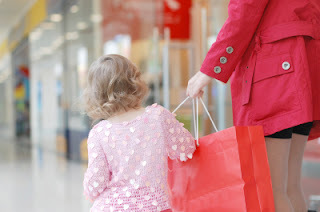 You can’t get out of the grocery store without your kids throwing a fit over buying junk food? Start making a list before you go, suggests Truex. Chat with your kids about what they need for breakfast and lunch (skipping the cookies and chips), and have them help you cross things off the list at the store. When the “Pleeeze, I need the CapN’ Crunch!” cries rear their ugly head, just say matter-of-factly that it’s not on the list. Lesson learned: Shopping isn’t about picking out whatever you want in the moment. You have to figure out what you need and plan ahead. This one’s old school, but say it enough—and let your kids see you make deposits at the bank—and the value of saving will start to sink in. Show them how your money is earning interest, and remind them that no matter what amount they put away in their own savings accounts (or on ThreeJars.com) their money can earn interest and grow, too. Lesson learned: Even little bits of money saved over time can really add up. You probably already know the answer to this question before you buy something, but ask it out loud anyway when your kids are around to let them see you debating a potential purchase. It’s another way to help them learn to prioritize their own wish list. Of course, you should let your children know that there are times – particularly special occasions like birthdays or other holidays – where wants can win. Lesson learned: You should always weigh the importance of a purchase by figuring out if it’s a want or a need. Your child may not really understand what having a job is about, but it’s okay to let them know that you earn your money by working. “Kids are often happy to spend their parents’ money faster than their own,” says Truex, because they think there’s an endless supply. You don’t have to announce that you got paid every payday, but doing it once in a while is a good reminder. Lesson learned: By working, you can earn money to buy the things you need and fun stuff, too.